උද්යෝග පාඨය: "Pro Mundi Beneficio"
පැනමාව, නිල වශයෙන් පැනමා ජනරජය ලෙස හැඳින්වෙන්නේ උතුරු සහ දකුණු ඇමෙරිකා මහාද්වීප අතර පිහිටි අන්තර් මහාද්වීපික රටකි. එය බටහිරින් කොස්ටා රිකාවටත්, ගිනිකොණින් කොලොම්බියාවටත්, උතුරින් කැරිබියන් දූපත් වලටත්, දකුණින් පැසිෆික් සාගරයටත් මායිම් වේ. රටේ අගනගරය මෙන්ම විශාලම නගරය වන්නේ ද පැනමා නගරයයි. එම පරිපාලන නගරය තුළ,මිලියන 3.9 ක් වූ රටේ මුළු ජනගහණයෙන් අඩක් පමණ වාසය කරයි. ↑ "Datos generales e históricos de la República de Panamá" (PDF) (in ස්පාඤ්ඤ). INEC. සම්ප්‍රවේශය 22 December 2015. ↑ File POP/1-1: Total population (both sexes combined) by major area, region and country, annually for 1950-2100 (thousands). World Population Prospects: The 2015 Revision (Report). United Nations, Department of Economic and Social Affairs, Population Division. July 2015. සම්ප්‍රවේශය 17 December 2015. ↑ Distribución territorial y migración interna en Panamá: Censo 2010 (PDF) (Report) (in ස්පාඤ්ඤ). INEC. 2014. p. 2. සම්ප්‍රවේශය 22 December 2015. 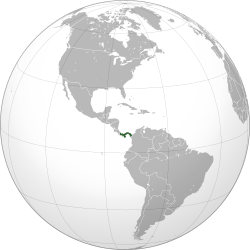 ↑ 5.0 5.1 5.2 5.3 "World Economic Outlook Database: Panama". International Monetary Fund. October 2014. සම්ප්‍රවේශය 3 January 2015. ↑ "Gini Index". World Bank. සම්ප්‍රවේශය January 3, 2015. ↑ "2015 Human Development Report" (PDF). United Nations Development Programme. 2015. සම්ප්‍රවේශය 15 December 2015. මේ පිටුව අන්තිමට සැකසුවේ 18 ජූනි 2016 දින දී, 16:27 වේලාවෙහිදීය.